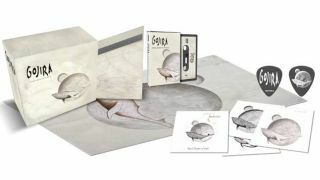 Gojira’s From Mars To Sirius is being reissued in a deluxe box set for its 10th anniversary next month. The repackaged version of the French outfit’s third album will be available in limited numbers via Listenable Records from February 12. Pre-orders are available now. The box includes an exclusive cassette version of From Mars To Sirius, four never revealed prints of frontman Joe Duplantier’s sketches made before the final cover art, an exclusive artwork flag with one of those sketches and an exclusive guitar pick. Also, a competition to win a Jackson guitar featuring From Mars To Sirius artwork will be available for the first 500 buyers to enter. Gojira are working on their sixth album at their purpose-built New York recording facility. This month, they released a behind-the-scenes video update on their progress.